Dean and Eileen Knox – Owners. Servicing Chicago North Shore and Northwest Suburbs for 40 years, one of the oldest, largest and most recognized of all the ServiceMaster Restore franchised businesses in the Chicago suburbs. ServiceMaster DAK provides a complete range of professional residential cleaning services that also include duct cleaning. Our technicians use the latest technology, equipment and cleaning methods to make your home sparkle, so that when we’re done, it’s not just clean, it’s ServiceMaster Clean. Whether it’s the middle of the day or the middle of the night ServiceMaster DAK is staffed and ready to respond to your home or business with expert fire restoration or water restoration services. Our restoration professionals are on-call 24/7/365. As ServiceMaster Restore is America's most trusted name in cleaning and restoration for over 50 years, ServiceMaster DAK's staff and the owners Dean and Eileen Knox are dedicated to going beyond your expectations. We hire quality people, train them well, and provide them with the most technologically advanced products and equipment. The result is extraordinary service that we guarantee. Your home is a huge investment. Keeping it sparkling clean is what we do best. 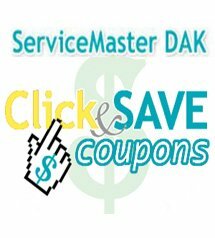 Let ServiceMaster DAK with 40 years of experience in cleaning and restoration in the North Shore and Northwest Chicago Suburbs help. We guarantee our services from start to satisfaction! Our highly trained, thoroughly screened technicians are dedicated to going above and beyond your expectations. Proper maintenance of your carpet, upholstery, floors and the general clean appearance of your business makes a statement to your staff, guests and customers. Trust the restoration professionals at ServiceMaster DAK for speedy response and expert service when disaster strikes your home or business. Whether it’s water in your basement or fire and smoke damage in the kitchen, we’ll restore your life back to normal.